At Abilene Family Dentistry, we know the alignment of your teeth is more than a cosmetic concern. While straight smiles undeniably hold visual appeal, they also have the advantage of being easier to clean and tend to experience less uneven wear and TMJ (temporomandibular joint) dysfunction. However, when people think of straightening teeth, they still envision mouths full of wire, brackets, and rubber bands, along with dietary restrictions for up to two years. We understand why that would keep people away from orthodontic treatment, but by now you’ve probably heard of the invisible aligner system that’s straightened over five million smiles worldwide: Invisalign®! Schedule a consultation today to get started! Invisalign aligners are transparent, so most people will have no idea you’re wearing them! That’s one compelling reason it’s such a popular way to straighten teeth, but we’d love to give you more details. As the original and most advanced clear aligner system in the world, Invisalign continues to improve their materials to make aligners fit more comfortably, and add new methods to speed up the treatment process—which is typically 50% faster than treatment with traditional braces! If you’re wondering whether Invisalign could work for you, scheduling a consultation with your Invisalign certified Abilene dentists is the best place to start. If Dr. Webb and Dr. Awtrey confirm you’re a candidate for Invisalign treatment, they will begin by taking digital scans of your teeth and sending them to the experts at Invisalign. Your digital scans will be used to create customized aligners and a treatment plan that digitally details the movement of your teeth and includes an image of your made-over smile! Your next appointment will take place when your aligners arrive. This is a great opportunity to show you how to insert and remove your aligners, explain how to care for them, and give you helpful tips and tricks to make wearing them a snap. 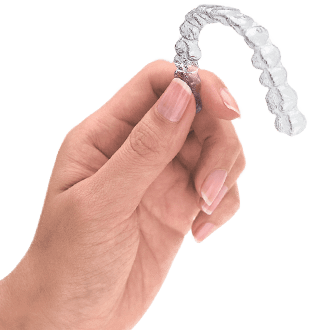 The SmartTrack material your aligners are made of is very strong, but also flexible and comfortable. However, you can expect some discomfort in the initial days of use as they’re applying pressure to shift your teeth. If the reason they’re uncomfortable is because of sharp edges, you can file them with an emery board to round them out and apply orthodontic wax to them. Besides being harder to detect than conventional braces, a favorite feature of treatment with Invisalign is the ability to keep eating your favorite foods and conducting your oral hygiene routines without difficulty. You won’t have to worry about broken brackets or wires, which means even fewer visits to our office, because you’re also given multiple sets of aligners to switch out every week or two, depending on your treatment plan. One thing that remains the same for every Invisalign treatment plan is the number of hours you’ll need to wear your aligners for each day. You’ll only want to remove them to eat, drink (unless it’s just water), brush, and floss. If you follow this guideline, you’ll be wearing them for up to 22 hours per day. Unfortunately, wearing them less than 20 hours per day can keep your teeth from moving as predicted, which may extend the length of your treatment. The five million and counting successful treatments that Invisalign has under their clear belt has helped them improve their process, from their scanning technology to the software that designs the aligners, to the materials used and the innovative systems created to further speed up the movements of teeth. Best of all, though, is the expansion of cases Invisalign can treat. Invisalign can work for teens and adults with overbites, underbites, crossbites, gapped teeth, open bites, and crowding. This makes it an ideal treatment option for a wide audience, though if you require significant alteration to your bite or movement along the vertical axis, it may not be right for you. Dr. Webb and Dr. Awtrey would be happy to help you find out either way. If you have any questions about Invisalign or you’re ready to schedule a consultation with your Abilene Invisalign dentists, Dr. Webb and Dr. Awtrey at Abilene Family Dentistry, give us a call today or request an appointment online. We look forward to helping you gain confidence in your smile!